the success of our team when they get 100% infection control audits! and spend your time on other things. We know that you can trust us to bring with us this wealth of expertise in the field of medical cleaning as we clean well over 80 surgeries and a large proportion of them have been with us for many years. From car showrooms to tourist attractions, offices to manufacturing premises and housing associations to public places, our commercial cleaning services can put the sparkle back into your premises. We don't just offer the best cleaning service around. We also offer a range of other cleaning services enabling us to deliver a complete cleaning solution to you..
At Vanguard Cleaning we have been passionate and professional about meeting the rigorous challenges presented by the healthcare sector since our inception over 17 years ago. It is what we like to think of as our company benchmark. Because we specialise in medical cleaning we are in a position to invest heavily in all those things that we know make a difference in medical environments. Like for example, our industry leading electronic audits specially written for ourselves and the clinical environments we clean. Like the robust and detailed health and safety system we have in place for the risks associated specifically when cleaning medical centres and of course not forgetting the investment we make in our people with practical and theoretical training and mentoring that is underpinned with regular and worthwhile management visits. 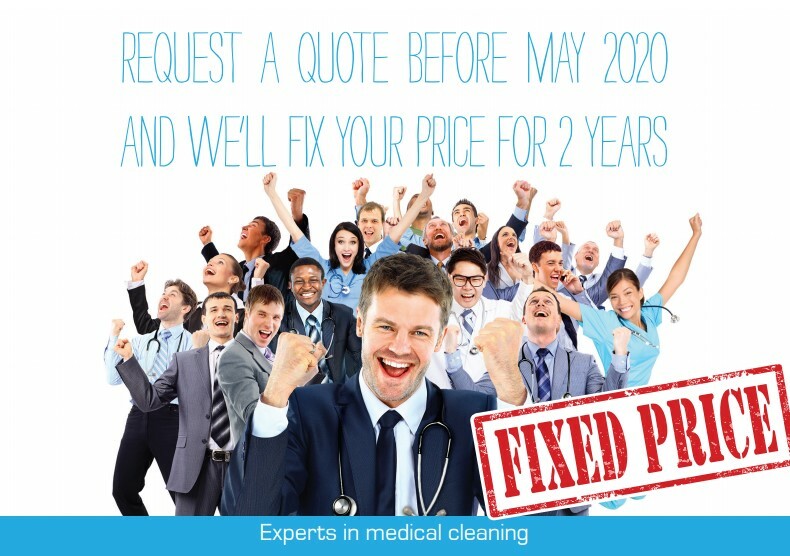 In these uncertain times wouldn’t it be great to fix your cleaning costs for at least the next 2 years ? 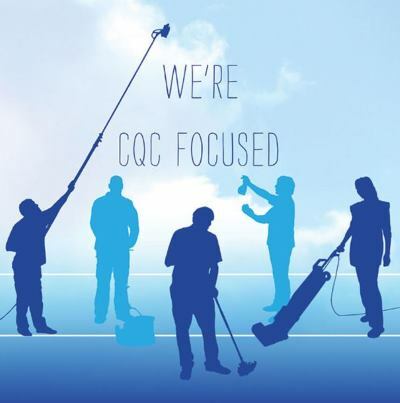 Vanguard are experts in managing the regular cleaning of your surgery, keeping you CQC compliant and freeing your time up to do more important (and interesting) parts of your job! Call or email us to discuss how we can help you. 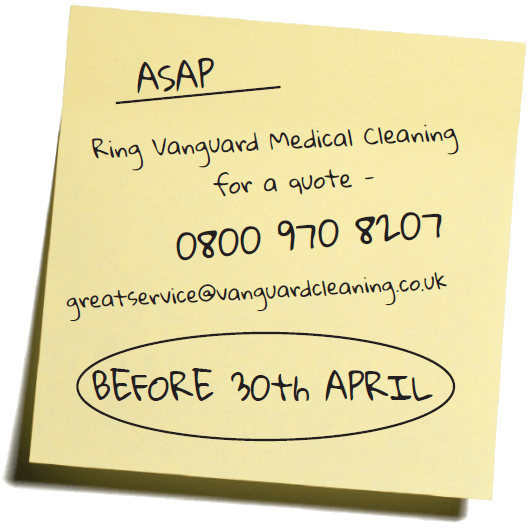 Having a copy of Vanguard audits each month means I can see cleaning standards are being monitored and maintained on my behalf. If excellent was 5 stars I'd give Vanguard 6. Vanguard have provided an excellent and highly efficient service. I wouldn't hesitate to recommend Vanguard, they truly deliver an outstanding service. During the time we have used Vanguard they have consistently provided a professional and reliable service. All cleaning staff are polite and professional and I have no hesitation in recommending them to anyone looking for a medical cleaning company. Proactive, helpful, trustworthy, all I need in a cleaning company. I would never go back to looking after it myself. When it comes to value for money, Vanguard are way out in front. We know we can trust to consistently deliver the hours of cleaning they promised. By the time you read this summer will nearly be over – I hope you’ve all enjoyed the amazing weather. It’s been pretty hectic here since we sent out the last newsletter. Not only have we started working for 9 new customers but we have also moved lock stock and barrel from our old home of nearly 10 years to our new of fices in St Martins near Oswestry. We are only about 5 minutes from our old address but out in the sticks a bit which is great - apart from more wasps and flies coming in and the odd tractor spreading manure! Our resident all round builder and super skilled tradesman, Peter, has worked wonders from roofing, joinery, plastering and even kitchen fitting. Please do come and see us if your passing. We’d love to make you a cappuccino and show you round. Our new address is on the back of this newsletter should you need it. A Newsletter like this could be so much better than that Facebook thing. We really want this newsletter to include as much about YOU as possible so we’d love to hear what’s going on in your life. Whether it be about marriages, babies, achievements out of work, unusual hobbies etc etc we want to know about it and share it with the rest of the Vanguard family! It is with enormous pleasure that I can introduce Vanguard’s first ever edition of a regular newsletter. I’m so sorry it’s taken so long - 16 years to be precise. That’s right - on 1st April 2002 Vanguard was born. I wouldn’t dream of boring you all with the details of the last 16 years but what I can say is that one theme has run consistently throughout the years. We have always looked to recruit friendly, caring, helpful people. It is with great pride that when I meet people today, many of whom have worked for us for many years, that I still see those characteristics shining through. Vanguard really is a different cleaning company from the rest. You may have worked for other companies and experienced these differences yourself. We’re certainly not the biggest, but when our customers so often take the time and trouble to contact me complimenting the huge efforts our team members go to deliver outstanding service, I certainly know we’re the best. We don’t just want to be the best for the customer though. At Vanguard Cleaning we have been passionate and professional about meeting the rigorous challenges presented by the healthcare sector since our inception over 17 years ago. It is what we like to think of as our company benchmark.